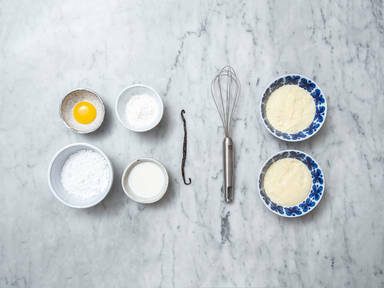 Add egg yolks to a large bowl, gradually add confectioner’s sugar, and beat until well combined. Add starch and beat until light. Add some of the milk and mix until combined. Set milk mixture aside. Split and scrape vanilla bean. Add remaining milk to a pot over medium heat. Add vanilla bean seeds and pod and whisk to combine. Stir often to keep milk from burning. Once milk is hot, add egg mixture, and whisk continuously until mixture thickens. Remove from heat. Enjoy!